Freckles to Toes: Vapour Organics Giveaway! 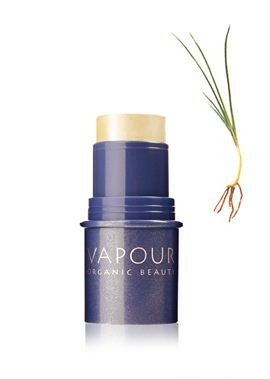 You've heard me rave about Vapour Organic Beauty before. They have designed a makeup line with covet-worthy ingredients, a rare breed indeed. They also spend a good amount of effort creating sustainable packaging and donating to multiple worthy causes. And now you get a chance to win one of their products! I recently reviewed their solid perfume, X Wisb* N°1. Upon further reflection, I have decided that the scent is best described by the word mystique. Vapour characterizes it as a warm, spicy, intoxicating scent, which I think nails it. Annnnd... (drum roll please!)... This is your chance to win your very own Vapour Organics Solid Perfume! 1) Comment on this post. Tell me how your transition to green beauty is going, what your new favorite discovery is (product, routine, DIY recipe), why you decided to go natural, or simply express your utter exuberance over this perfume! 2) Follow Freckles to Toes by clicking the button on the right labeled: "Join this site" with Google Friend Connect. Once you complete these two easy-peasy steps, you're entered to win! You have one week to enter. One lucky winner will be chosen at random on November 17th. So go get to it! Good luck! New favorite product is my Bubble & Bee lotion stick in the coconut lime flavor! I think as I've become more aware of the world and how it works, I've become more and more interested in a 'green' way of thinking. There are so many ways to work more natural ways into your lifestyle that I'm surprised people don't do it more often! Based on your suggestions, I've almost entirely transitioned over to natural personal care products! I think my favorite is my Bubble and Bee deodorant. I swear it works even better than most strongly scented chemical varieties. So thanks for all your insight. And I hope I win so that I can lure my sister over to natural beauty products! My natural secret? Cornstarch! Just plain. Nothing else. Makes the best deodorant ever. I recommend cornstarch with a powder puff. Very nice. Very easy. I am really enjoying the organic essence lip balms. The biodegradable packaging is a big plus and they have wonderfully simple organic ingredients. My favorite so far is Bubble and Bee anything! The body butter smells delicious enough to eat and the scent of the soap makes me swoon! I've started cutting up little pieces of it to take with me to use in public restrooms. I've been using Giovanni shampoo and conditioner as well as styling products for a few years, i use collective wellbeing skin cleaning products, various different shea butter bar soaps and doctor bronner's soaps, and nature's gate spf 25 face block. still haven't found a sun block that i like for my arms and legs yet, so i'm still using neutrogena with helioplex. makeup is harder, because i like liquid makeup but i am also neutral tone complected and pretty fair. i'm the fairest color in l'oreal makeup. I like the Alba Botanica Terra Tints lip balm for when I want lip color, and just Burt's Bees when I don't. But I find that the best cosmetic product is water. Lots and lots of water keeps my weight lower and my skin clearer, and I just function better when I'm well hydrated. I've gone through a thorough transition. Bubble and Bee is great for skin creams & deo, Aubrey Organics for shampoo and conditioner, Vapour Organic Beauty and Monave for makeup, real purity mascara, Dr. Bronners soaps, Max Green Alchemy for hair gel, Giovanni hair mousse, Badger UV A&B sunblock, unrefined shea butter, essential oils for perfume. I love knowing that what I'm putting on my body is more pure and healthy than the junk I was using before. Would love this perfume giveaway!! I have been searching for an organic type of parfume that doent smell like lavender or patchouli...not alot out there. Ive been using green organic products since I was able to buy my own health and beauty products, its better for me and the planet! Now Ive come across Vapour and I would love to try this on..I may become addicted and keep buying the scent for the rest of my blessed time here ;). Thankyou for hosting this great giveaway and letting people discover there is a world of products that does NO harm to our bodies!!! Id love to try this one on!! I've been "going green" for about two years now, and its always a work in progress! My new favorite product is Ilia's red lipstick, Bang Bang - its gorgeous! It actually reminds me a lot of Vapour's lipstick in Ravish, also beautiful!